Artificial sweeteners may assist in weight management, prevention of dental caries , and control of blood glucose for diabetics. It has also been suggested that low-calorie sweeteners may stimulate the appetite, but the bulk of evidence does not support this hypothesis. Conclusive research demonstrates that artificial sweeteners have no effect on carbohydrate metabolism , short- or long-term blood glucose control, or insulin secretion, and they are thus an excellent sugar alternative for diabetics. There have been a number of health concerns related with these products, though the Food and Drug Administration (FDA) approval process for artificial sweeteners involves a comprehensive analysis of scientific data to satisfy safety requirements. All "generally recognized as safe" (GRAS) sweeteners have undergone extensive safety testing and have been carefully reviewed by the FDA. Acesulfame potassium (Acesulfame-K) was discovered in 1967 and approved for use in the United States in 1988. Its trade name is Sunette. Two hundred times sweeter than sucrose , this sweetener is stable when heated, making it suitable for cooking. However, when used in large amounts it has a bitter aftertaste. It is not broken down by the body, and it does not provide any calories. Over ninety scientific studies have been conducted by the FDA, and the World Health Organization's Joint Expert Committee on Food Additives (JECFA) has also endorsed Acesulfame K's safety. Aspartame was discovered in 1969 and approved for use in the United States in 1981. Its trade name is NutraSweet. Also two hundred times sweeter than sugar, aspartame is not suitable in applications that require high temperatures, as it loses its sweetness when heated. It contains four calories per gram, but, because of its intense sweetness, the amount of energy derived from it is negligible. It is synthesized from aspartic acid and phenylalanine, two essential amino acids . Persons with the rare hereditary metabolic disorder phenylketonuria (PKU), an inborn error of metabolism, must control their intake of phenylalanine from all sources, including aspartame, and therefore all U.S. products containing aspartame are labeled "This product contains phenylalanine." Because it is impossible to know if an unborn child has PKU, it is recommended that pregnant women not use aspartame. The FDA states that aspartame is the most thoroughly tested food additive ever submitted to the agency. A few popular alternatives to table sugar include sucralose, aspartame, and saccharin. Despite controversy over potential health risks related to their consumption, each of these products has undergone a decade or more of scientific testing and is generally recognized as safe. no special PKU labeling is required. The FDA reviewed more than 113 human and animal studies before ruling on neotame. Saccharin was discovered in 1879 and approved for use in the United States in 1879. Its trade name is Sweet'n Low. Three hundred to five hundred times sweeter than table sugar, saccharin provides no energy, as it is not metabolized by human beings. It has a bitter and somewhat metallic aftertaste. The largest population study to date, involving nine thousand individuals, showed that saccharin does not increase the risk of cancer , and on December 15, 2000, the U.S. Congress passed legislation to remove the warning label that had been required on foods and beverages containing saccharin since 1977 (warning labels were required because of findings that saccharin caused bladder tumors in mice when they were given high doses of the sweetener). Saccharin is approved in more than one hundred countries around the world and has been reviewed and determined safe by the Joint Expert Committee on Food Additives of the World Health Organization and the Scientific Committee for Food of the European Union. 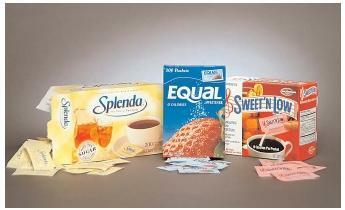 Sucralose was discovered in 1976 and approved for use in the United States in 1988. Its trade name is Splenda. Six hundred times sweeter than sugar, sucralose is not absorbed from the digestive tract, so it adds no calories to consumed food. It is made from rearranged sugar molecules that substitute three atoms of chlorine for three hydroxyl groups on the sugar molecule. Sucralose has been tested in more than one hundred studies. Sugar alcohols are not technically artificial sweeteners. Examples include sorbitol, xylitol, lactitol, mannitol, isomalt, and maltitol, which are used to sweeten "sugar-free" foods such as candy, cookies, and chewing gum. The alcohols have fewer calories than sugar, do not promote tooth decay, and do not cause a sudden increase in blood glucose because the bloodstream does not easily absorb them. They may cause, however, effects similar to a laxative if consumed in excess. Products containing large amounts of sugar alcohols must be labeled with the warning: "Excess consumption may have a laxative effect." Artificial sweeteners taste sweet like sugar without the added calories. They do not promote tooth decay, and they are an acceptable alternative for people with diabetes or those wishing to decrease their use of sucrose. Artificial sweeteners, and their metabolic by-products and components, are not considered harmful to human beings at the levels normally used. When used in the context of a healthful diet , artificial sweeteners are generally safe for consumption. SEE ALSO Generally Recognized as Safe ; Inborn Errors of Metabolism ; Phenylketonuria . American Dietetic Association (1998). "Position of the American Dietetic Association: Use of Nutritive and Nonnutritive Sweeteners." Journal of the American Dietetic Association 98:580–587. Drewnoski, A. (1995). "Intense Sweeteners and Control of Appetite." Nutrition Review 53:1–7. Joint FAO/WHO Expert Committee on Food Additives (1993–2003). "Evaluation of Certain Food Additives and Contaminants." Geneva, Switzerland: World Health Organization.